Drops a baby lynx in your lap. Oh and more supporting evidence. Obama a fresh young senator from Illinois became president and in the wake of the 2008 recession reacted (and possibly paniced) by bringing on many members of Bill clintions staff for their expertise to handle the situation. The issue is that the economic and financial portion of Bill Clinton's administration was by far the most right wing and corporate part. Obama's subsequent handling of the recession has been one of the most criticised aspects of his record. Perhaps we would of made a stronger recovery if he had more knowledge of possibe experts and adviser, and didn't just defer to the Clintions. Oh and finally I think Yang and Sanders would make a great president ticket. As I've said elsewhere for Sanders to beat trump he just needs to win back working class white voters in traditionally blue states that voted for Obama but Hillary lost. Yang has a great populist platform to help with that, like bernie he polls great with the kids who need lots of motivation to get to the polls, and also makes up for some of Bernie's weaknesses like being a successful businessman to neutralize socialist arguments made against Bernie and Trumps own claims of financial success, and he's a person of color which some people find very important. I curse you with no bike from Jaghatai's shed! Day 40, still no bike, but I did strap a saddle on the Dreadnought and am riding that like a horse. ancient reptilian alien new world order magic of course. I dont know why I watch Destiny and Sargon argue. They just spend an hour reeeeeing at a microphone and don't get anything accomplished. I don’t know why anyone watches youtubers. For the same reason you go to Tvtropes by mistake and may end up spending all night there? Same reason you've spent 10s of thousands of euros on MLP plushies. To deal with my debilitating depression. 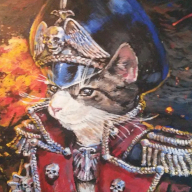 The Officio Prefectus vehemently denies the existence of cat officials within the Commissariat. I have this strong mental image of Rick Moranis singing this (badly). I am honored that you thought I warrented this comparison. I got a way to reboot Dead Cosmos. We do short stories and I mean short based on prompts we give each other and as we keep going we add to the setting. You could ask Parris on Discord for info and he could help work it out with you. There is the Dead Cosmos server to try that as well. Hey boss! How is it going? Also, can I ask you a quick question? Getting ready for work, and go ahead. How are you doing, Lord Adornable? About to over dose on Sunny-D.
"Golden Souls Alight, Imperial Fists Stand With Pride, Too Stubborn To Die, In Death We Will Fight!" From HMKids song about the Imperial Fists. Quite a good song. And, your username and avatar reminds me of the song for obvious reasons. So you’re part of the Celine family. Ok then. Any idea who the real Celine is? This is going to end like one of V.C. Andrews novels, isn't it? No need to apologize, I'm rarely if ever upset when preforming moderation duties. You just need to put your foot down every once in a while. Same here, @Lord Inquisitor Adornable. Sorry I made trouble for you. How many reports do you guys have to deal with on a per day basis? I am rather curious how it compares to SB. Didn’t we already establish that NotArcanist is really LT Ryguy? No Aaron Fox is secertly LT Ryguy, remember it was revealed at the last Illuminati meeting? I got dis-invited to those after the incident with the mimosas, the lighter and the capybaras. Why the follow for me of all people? So having watched a bit of Casablanca now, are you saying you’re a Nazi Major and Horton is Hitler with me a young kid who needs to get out of here on a plane to avoid a kitty kat concentration camp. Or that I’m a usual suspect and you’re the nameless Frenchman thus I’m just going to be purged for nothing? Huh, and here I thought this site was supposed to be a safe space for those who fell afoul at SB. Somedays are easier then other, I can't even sleep now. You got time to read my thing? I'm about to go to bed so sure link me. Read? and how are issues with sleep? He is always a fun read and well worth it.. I wrote two pieces in the creative writing section here. Would you like to gave a read? I'm about to go to bed will read tomorrow. Sometimes I'm afried we all can't get along. It's depressing. They must really hate you then. Edit: if they hate me it would've been my own fault. Besides I don't think mods anywhere ever gave me any special attention. At least I don't think so. I do indeed think there are many who dislike my very presence here, and with many, I mean BASICALLY half of this site. Daily reminder that flint Michigan still doesn't have clean water. Republicans, Democrats, Obama, Trump. No one cares about Flint. And I find that a bit saddening. But, something I will have to live with. Either way, sleep well, Lord. Happy new year to you too. I am being told I am a hypocrite now for not wanting to see women as slaves, as once was done in ancient times when the biblical books were written, and not wanting to see mass murder of sinners, as once was done in the ancient times that the biblical books were written. Can I ask, what madness is this?